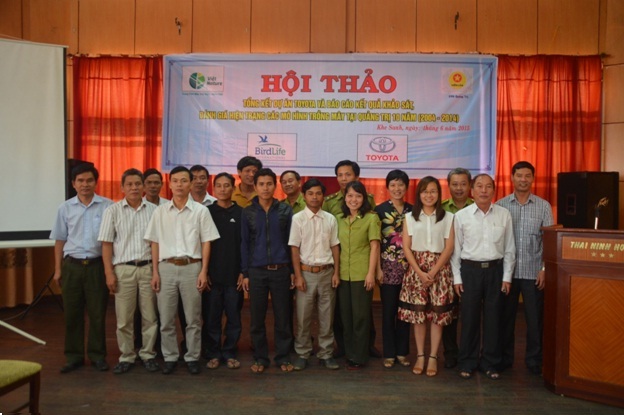 Khe Sanh –June 29th 2015, the closing workshop of the Toyota project and results of the status assessment of rattan planting models in Quang Tri in 10 years (2004-2014) took place in Khe Sanh Town, Huong Hoa District, Quang Tri Province under the co-organisation of Viet Nature Conservation Centre and Quang Tri Forest Protection Department. The Toyota project entitled “Promoting local communities’ stewardship of forest resources for improved livelihoods and wildlife conservation in Quang Tri province, Vietnam” was implemented by Birdlife International Asian office, Viet Nature Conservation Centre and Quang Tri Forest Protection Department under the sponsorship of Toyota Japan. At the workshop, the representative of Viet Nature summarized results of the status assessment of rattan planting models in Quang Tri over 10 years ( 2004 – 2014) in Dakrong and Huong Hoa district. In recent years, many projects financed by both national and international sponsors like BCC, Birdlife International Vietnam Programme or DANIDA have been widely implemented in the province; however, no model has brought practical economic benefits to the community so far. In fact, most of the rattan in these models experienced poor growth. Other models, which provided well – grown rattans, on the other hand, failed to meet with the market’s demand, imposing great difficulties to the farmers rather than offering them any profit. Given the state of the existing models, the evaluation team proposed some comments and recommendations to develop similar models but of better efficiency in the future. Simultaneously in the workshop, the representative of Viet Nature also presented a comprehensive picture of the activities and results of the second phase of the Toyota project in 2014 – 2015. Inheriting the experience and recommendation from previous models, Viet Nature introduced an innovative approach via combining forest protection contract with forest enrichment to improve local communities’ livelihoods. Before that, the first phase of the project in 2012 – 2013 was enthusiastically supported by both local people and authorities; therefore, the second phase continued to replicate the models in the other areas. So far, the project has made significant achievements, the most important one was to allocate 120 hectares of natural forest to 24 households in Ho village, Huong Son Ward, Huong Hoa District under forest protection contracts, and at the same time, support them to plant 24 hectares of rattan under the allocated forest’s canopy to improve their livelihood. Based on Viet Nature’s report, the delegates were quite enthusiastic in giving their ideas and introducing other models, which are potentially effective in terms of enhancing local people’s living standard as well as protecting and restoring natural forest habitats. 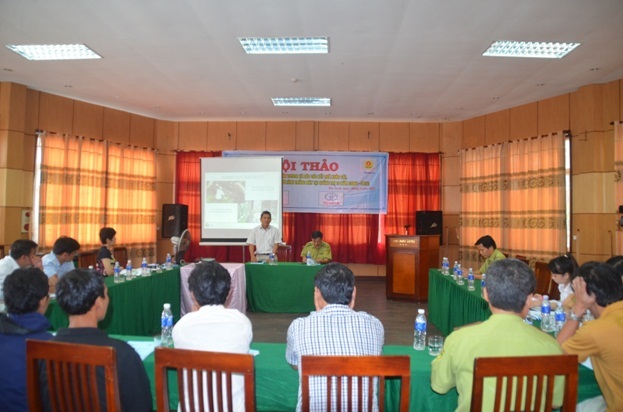 In particular, representatives from WWF Thua Thien Hue or Dakrong District Agriculture and Rural Development Department also exchanged their practical experience in developing and expanding rattan planting models in the province. Such information would be of great value in developing and implementing any future rattan planting models of Viet Nature in particular and other projects in general.